Field grown trees are supplied either bare root or root balled from mid October to April, dependant on variety and size. Growing on our 105 acres of ‘Grade 1’ type soil, excellent fibrous root systems are naturally produced which when combined with our strict growing regime, produce strong healthy trees ready for the most challenging of sites. Lifting and dispatch is carried out strictly to order from November to mid April, and are despatched with the minimum of delay to ensure they leave ‘nursery-fresh’. Bare root trees lifted from our fields are supplied with their roots protected by a co-extruded bag. J. A. Jones uses exclusively the co-extruded bag with its tough black inner & white shiny outer surfaces, at no extra cost to the customer. This is the best available and needless-to-say, plays a vital role in aiding the successful establishment by preventing the roots from drying out. Trees of 10cm girth & above can be supplied with a wire root ball. This ensures the soil remains in intimate contact with the roots throughout lifting, transportation and planting operations. The ball of soil enclosing the roots is secured by the use of hessian wrap, and an un-galvanised wire net. This should not be removed during planting, and will bio-degrade within two seasons. These can be easily handled using tree hooks available from J. A. Jones. Root balls are particularly useful with species which are known to be difficult to transplant. Such species include Betula, Carpinus, Fagus, Liquidamber, Pyrus, Quercus and Robinia. For the supply of trees from May to October of a girth sizes less than 16cm, J. 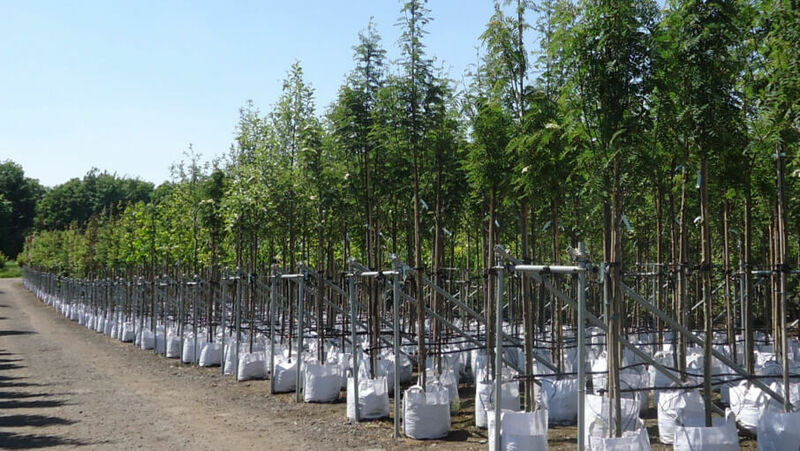 A. Jones & Sons grows a range of containerised trees in white bags. These trees begin life in our fields, before being lifted in early spring and potted directly into our tree bags. 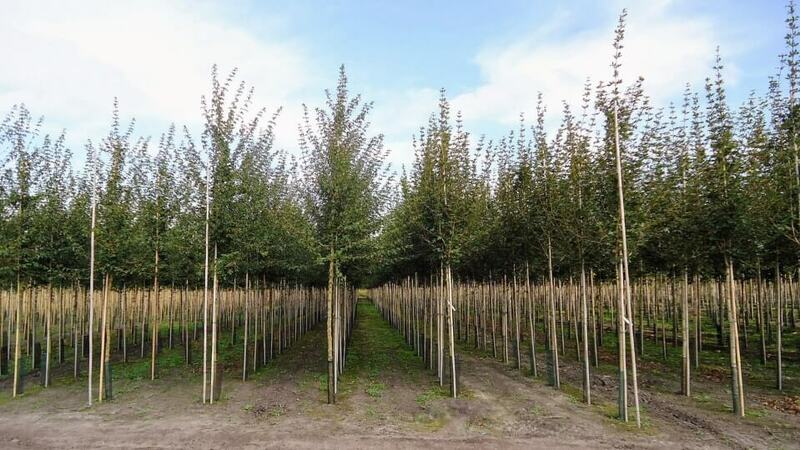 Treated to the same rigorous pruning and training regimes as our field grown stock ensures these trees conform to the same high quality standards as our field stock. For the supply of trees from May until October, trees 14-16cm girth and larger are grown using the air pot system. This consists of a perforated plastic sleeve surrounding the root zone, allowing them to be air pruned at their tip, encouraging the build up of a stable fibrous root system. Prior to delivery, the plastic sleeve is removed, and the root system is wrapped with hessian wrap and wire cage. For schemes that require a more formal look, J. 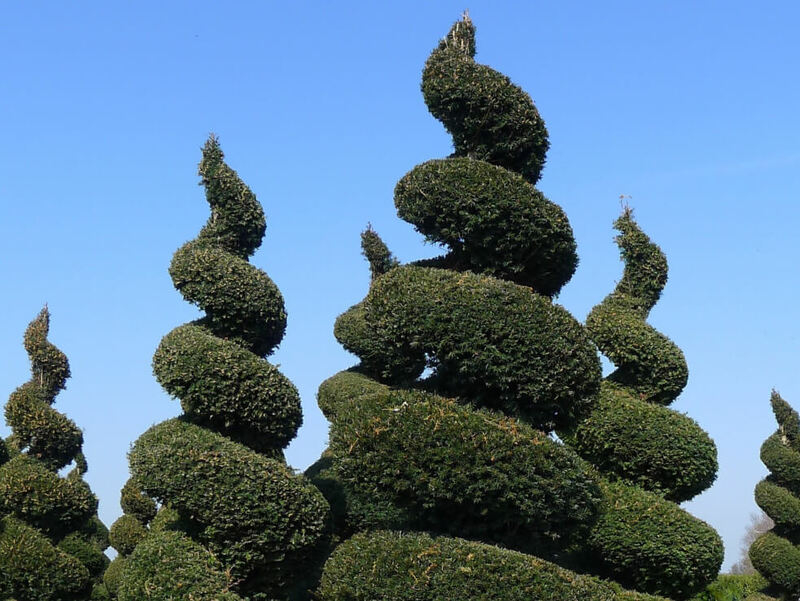 A. Jones can now offer a range of shaped trees. Shapes available include boxheads, espalier, pleached, screens, arches, roof forms, cones and balls to name but a few. These are available price on application. 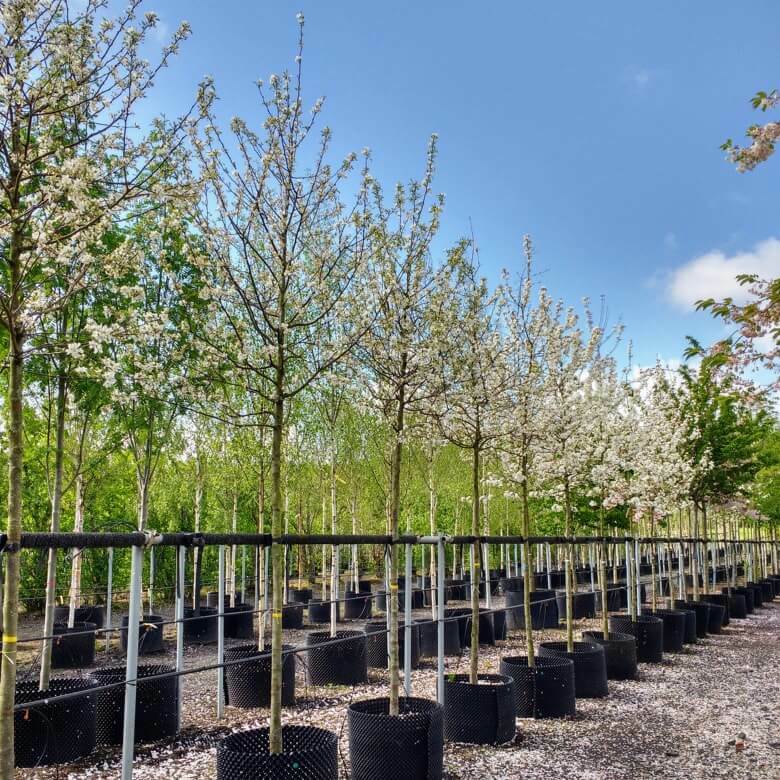 Whether required to provide screening or simply as a decorative feature, these trained trees continue to inspire and delight in equal amounts.